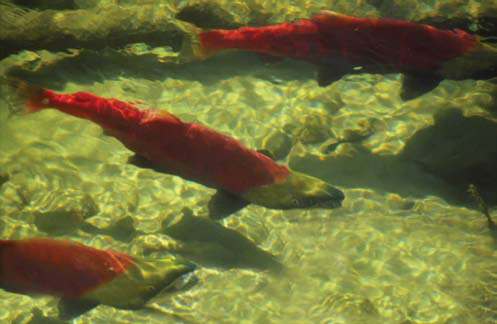 Phenological events triggers Sockeye Salmon migrations (photo credit: USFWS). Phenology is the study of seasonal or periodic cycles in ecosystems. It is, essentially, “nature’s calendar.” For fish, phenology is often linked to timing of important life events such as spawning, migrations, and hatching. These events are triggered by non-biological factors like day length, temperature, and precipitation. If the timing of the main “cue” shifts, the alteration can have significant implications for the fish populations that have evolved to optimize the timing of their life events with that factor. Many fall–spawning Pacific Salmon populations (Oncorhynchus spp. ), for example, are beginning their freshwater migrations earlier than in the past (e.g. Kovach et al. 2015). This consistent trend across species and populations strongly suggests that a shared environmental driver (i.e., climate change) is responsible. Unfortunately, these altered behaviors can be maladaptive – Cooke et al. (2004) found that increased pre-spawn mortality rates – sometimes in excess of 90% – for several stocks of Fraser River sockeye salmon (Oncorhynchus nerka).